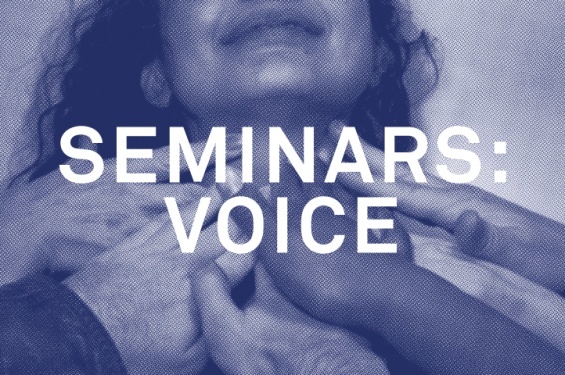 On Friday June 6, the inaugural group of participants of New Museum Seminars: (Temporary) Collections of Ideas will host an evening of discussions, interactive exercises, performances, and lectures coming out of the group’s investigations into the R&D VOICE Season thematic. The Seminars gather multidisciplinary thinkers together on a weekly basis at the New Museum to discuss pressing concerns related to art and the expanded art context over a twelve-week period. Seminar participants have invited four artists and writers—Daphne A. Brooks, Chris Mann, Robert Sember, and Christine Sun Kim (whose practices have been fundamental to the concepts explored during the semester)—to present new works or ideas in progress. The evening event marks the culmination of the Seminars and opens to a wider public forum. The Seminars operate as a peer-led platform to investigate seasonal topics developed over multiple platforms (performance, exhibitions, educational programs, etc.) by the Museum’s Department of Education and Public Engagement. This Season is devoted to VOICE in all its valences: from inquiries into the political agency inherent (or not) in speech, to embodied practice, to the possibility that meaning is located outside language. During the course of the semester, the group has put together a joint bibliography comprised of texts and artworks that critique the dualism that has historically plagued discourse around voice. These include foundational poststructuralist, feminist, postcolonial, and queer theory texts alongside other fields of thought and practice, such as opera studies, communication theory, and critical animal studies, in order to pursue questions about the disembodied voice, acoustemologies, political speech, and radical forms of subjectivity. Brought together by mutual, if not always compatible, interests in VOICE, this Season’s group of participants is made up of artists, scholars, curators, students, radio show hosts, advocates, activists, enthusiasts, and more. Since March, the group has discussed objects of study useful to respective research and shared conversations. These have focused on theoretical and artistic objects such as Brooks’s scholarship on African-American female artists in popular music, Mann’s writing and performances coming out of compositional linguistics, Sember’s sound-based pedagogy and long-term archival work with Ultra-Red (which deals with the acoustic mapping of contested spaces and histories), and Sun Kim’s performances that address the relationship between sound and spoken languages, often through audience interaction or spatial mapping. In individual presentations and group dialogue, the four invited artists and writers will further reflect on VOICE. Daphne A. Brooks is Professor of English and African-American Studies at Princeton University where she teaches courses on African-American literature and culture, performance studies, critical gender studies, and popular music culture. She is the author of Bodies in Dissent: Spectacular Performances of Race and Freedom, 1850–1910 (Duke University Press, 2006), and Jeff Buckley’s Grace (Continuum, 2005). Brooks is currently working on a new book entitled Subterranean Blues: Black Women Sound Modernity (Harvard University Press, forthcoming). She is the author of numerous articles such as “Nina Simone’s Triple Play” in Callaloo, “This Voice Which Is Not One: Amy Winehouse Sings the Ballad of Sonic Blue(s)face Culture” in Women and Performance (2010), and “‘All That You Can’t Leave Behind’: Surrogation & Black Female Soul Singing in the Age of Catastrophe” in Meridians (2008). “Engines of Modernity: Black Sonic Women & the Open Road” is a paper that explores the politics of race, gender, sexuality, region, and automobility in popular music culture through the work of three drastically different black sonic women from the previous century: Zora Neale Hurston, Etta James, and Mary Lou Williams. Examining the ways that each of these artists drew on concepts of automotive technologies to craft their respective sound aesthetics, Brooks’s talk will explore a radical politics of black womanhood that perpetually and imaginatively disrupted the constraints of Jim Crow patriarchy. New York–based artist Christine Sun Kim uses the medium of sound through technology, performance, and drawing to investigate and rationalize her relationship with sound and spoken languages. Selected group exhibitions and performances include: “Subjective Loudness,” Sound Live Tokyo (2013); “Rehabilitating Silence,” in collaboration with nyMusikk and Dans for Voksne, Ultima Festival, Oslo (2013); “a real line ran near an ear,” in collaboration with Shira Grabelsky and Stijn Schiffeleers, Southern Exposure Artists Residency, San Francisco (2014); “Feedback: Seeing Voice,” Recess Activities and Center for Experimental Lectures, New York (2013); “Face Opera II,” Calder Foundation, New York (2013); and “Soundings: a Contemporary Score,” Museum of Modern Art, New York (2013). With collaborator Wolfgang Müller, she released a set of seven-inch vinyl records Panning Fanning (2012–13), and was a recipient of Youth Insights Artist Residency at the Whitney Museum, Mellon Tri-College Creative Residency at Haverford College, and a Fellowship at TED. Deaf from birth, Kim has established her own “voice” through experimentations in sound art including using the audience voice as her own, conducting a group of people to sing with facial movements (rather than sound), and by drawing visual scores. These scores raise questions on linguistic authority, ownership of sound, and oral languages as social currency. The visuals and codes that comprise these paper scores are the result of actions by Kim where she combines information systems and languages known to her as a deaf person, letting grammar rub against itself. Having come upon more similarities than differences between music and American Sign Language, Kim will focus on the former during her talk. Chris Mann will be performing an excerpt from his recent work “chewy” (2014). language is the mechanism whereby you understand what i’m thinking better than i do (where i is defined by those changes for which i is required). Robert Sember is a member of the international sound art collective Ultra-red. For twenty years, Ultra-red has investigated the contribution experimental sound art can make to political organizing. Ultra-red projects focus on concerns related to (im)migrants’ rights, affordable housing, sexual and gender rights, and struggles with racism and poverty. Sember is the co-facilitator of Ultra-red’s Vogue’ology initiative, a long-term collaboration with the House and Ballroom scene that was initiated during his 2009¬¬–10 fellowship at the Vera List Center for Art and Politics. He teaches in the art program at the New School’s Eugene Lang College. In 2009, Ultra-red launched School of Echoes, a long-term, multisite investigation into collective listening procedures to support community organizing. Predicated on a shift from composing sound to organizing listening, this investigation’s central question is “what did you hear?” This question positions sound as a medium and site of inquiry—creating discourse about taxonomies of listening available in cultural and political settings. Sember’s presentation will provide an overview of the School of Echoes’ conceptual foundations and modes of investigation.